In the race to keep pace with advances in technology — and citizens’ needs — many government agencies find themselves falling behind. Legacy systems built to fulfill business functions designed years ago have served their purpose but have grown expensive to maintain and unable to evolve with the times. A new FedScoop special report, sponsored by cloud platform provider Salesforce, tackles the “Digital Dilemma” of how to meet today’s customer demands when yesterday’s technologies dominate. Constituents’ expectations of their governments are changing all around the world. Rather than spending hours on the telephone or in line waiting to be served, today’s citizens want to interact with government online the same way they work, read and shop. Agencies that fail to provide a user-friendly online experience fall short of their public service mission. Replacing complex, critical systems would be costly and cumbersome, entailing undesirable and potentially dangerous shut-downs. And yet, updating and securing these systems is crucial to nimble, agile delivery of services. Thanks to the cloud, agencies can augment — rather than replace — their existing systems with state-of-the-art features and offerings that remain perpetually up to date, “future-proofing” themselves against obsolescence or irrelevance. The cloud offers a platform with which to modernize services economically and securely, and to implement new features without needlessly disrupting operations. Getting started on the road to modernization may be easier and more cost-effective than agencies might think. The key lies in focusing on people, processes and technologies, in that order, and making the transformation gradually rather than trying to do everything at once. 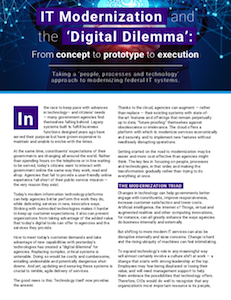 Download the special report, “IT Modernization and the ‘Digital Dilemma’: From concept to prototype to execution,” for IT modernization case studies from the U.S. Department of Agriculture and Amtrak and recommendations for smoothing the transition to modernization in the cloud.